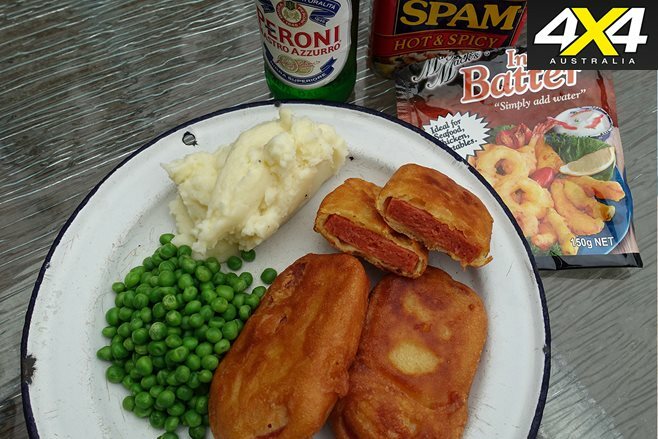 SPAM is sold in virtually every grocery store Australia-wide, and we’ve found it easy to get wherever we go, making it an ideal camp food. It’s even said that there are 12.8 cans of Spam products eaten every second, and that Spam festivals are held all over the USA. What is it? Spam is, in fact, made up of only six simple ingredients, and it’s mainly a blend of chopped pork and ham. Here are two ideas on how to use it in a meal when you’re camping. – Make the batter mix by combining all the batter ingredients in a bowl. It should be a thick mixture to coat the Spam. – Cut the Spam into 7-8 thin slices and pat dry. – Heat the oil in a pan until it’s hot. You’ll need enough to give a good cover in the bottom of the pan. – Dip each slice into the batter mix and then drop carefully into the oil. – Shallow fry for about 2-3 minutes on each side until golden brown and crisp. – Drain on paper towel and serve with mashed potatoes. – Place flour, eggs and panko crumbs into three separate dishes. – Dip each slice of Spam first into the flour then into the beaten eggs, making sure it is evenly coated. – Drop the slice into the crumb mix and spoon crumbs over the top. – Press down before turning over, and then spoon more crumbs over the top and press down again. – Shallow fry until golden brown on both sides. – Add it to a potato salad – cut into small cubes. – Add it to fried rice – cut into cubes and sauté until browned. – Add it to scrambled eggs – cut into cubes and sauté until browned. – Add it to spaghetti carbonara – cut into cubes and sauté until browned. – Add it to a couple of fried eggs – just slice it and fry it. – Add it to a few slices of pineapple – slice it and fry it with the pineapple.